The value of a Air - Var. 2 - 17 cents 1946 stamp depends on several factors such as quality and wear, supply and demand, rarity, finish and more. Values in the section are based on the market, trends, auctions and recognized books, publications and catalogs. This section also includes information on errors and varieties and characteristics. Aerial view of Quebec City looking northeast, showing the Plains of Abraham in the foreground. 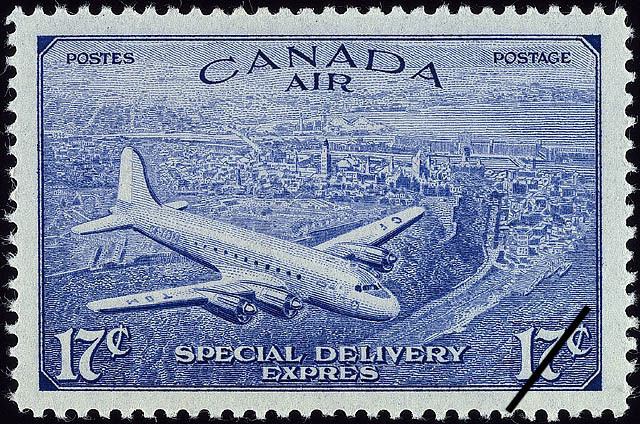 Superimposed on the picture is a drawing of the D.C. 4-M airplane, which at the time of the issue was under construction in Montreal for use on the trans-Atlantic mail and passenger route, and on the trans-Canada run. At that time, it was the most recent development in Canada's transportation industry. The 1st and comparatively small printing of this stamp was found to contain a small error shortly after it was issued. The accent over the second "e" of the French word "Expr�s" was circumflexed instead of grave. This error, corrected in the new die, is the first in a Canadian postage stamp.